Have you ever seen a situation that made you uncomfortable, but did not know what to do? Have you ever needed help, and wished someone would step in to help you? Have you ever been concerned about a friend or neighbor, but were not sure how to talk to them? UM Housing wants you to Step UP! and learn to support other students with these challenging situations. Step UP! is a prosocial behavior and bystander intervention training program that educates students to be proactive in helping others. Students that attend the training will learn information about how to Step UP! when someone else is in need, offer support, and call for help. Students will gain valuable skill sets to help them help their communities. The University of Arizona C.A.T.S. – Commitment to an Athlete’s Total Success Life Skills Program, along with the National Collegiate Athletic Association (NCAA) and national leading experts, has developed the Step UP! Be a Leader, Make a Difference program. 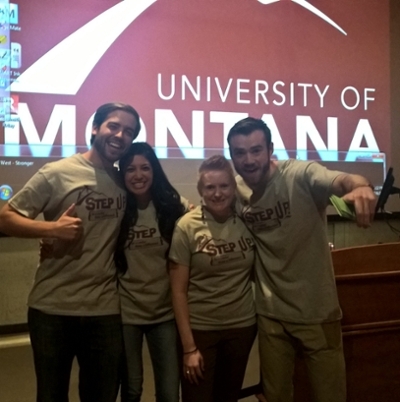 Hundreds of colleges, universities, and organizations are using Step UP! with their students and the University of Montana is one of those institutions! Check out more about the Step UP! Be a Leader, Make a Difference program by going to the Step Up! website. UM Housing offers Step UP! trainings for you, right inside your Residence Hall community. Students who attend the training gain valuable information and training in order to help their friends and community, and a free t-shirt distinguishing you as a leader if you choose to sign a pledge to Step UP! Watch for information posted in your halls and apartment community centers regarding Step UP! trainings. For information on upcoming trainings or to request a training contact David Petrie at david.petrie@mso.umt.edu. Along with the Step UP! trainings, you will see around your Residence Hall or apartment community resources and information provided by the Step UP! program that will continue your work in being proactive in helping others.